Whether your company is large or small, software vendor negotiations are crucial in ensuring you're getting the best deal for your money. On the contrary, midmarket CIOs have more sway than they think. 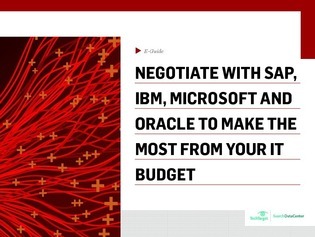 Next time you negotiate with your suppliers, ensure you get a better price—and get more from your IT budget—from likes of SAP, IBM, Microsoft and Oracle. Access this complimentary expert guide to adapt to changing business needs and discover vendor negotiation tips for working with these vendors from Forrester Senior Analyst Duncan Jones.